Recent years have seen a growing academic interest in the migration of MFAs (foreign ministries) to social media. However, the majority of digital diplomacy studies tend to focus on the activities of Western and North American MFAs. This Euro- and American-centric approach fails to recognize the fact that digital diplomacy is now a global phenomenon. From Nairobi to Bogota and Seoul to Baku, foreign ministries throughout the world are adapting their practices to the online sphere. One geographic region witnessing a digital revolution is Africa, where MFAs have migrated en masse to social networking sites (SNS). The foreign ministries of Botswana, Uganda, Namibia, Somalia and Ethiopia all operate Facebook accounts, while MFAs from Mali, Niger, Kenya and the Democratic Republic of Congo are active on Twitter. African MFAs also seem to be as adept at using social media as their Western peers. A recent study by Kampf, Manor & Segev found that African MFAs are as active online as their European counterparts, suggesting that in digital diplomacy, the digital divide may be narrowing. The incorporation of social media into the conduct of diplomacy may bring additional value to African countries in three main areas: diaspora diplomacy, networked diplomacy, and nation branding. Given the size and global spread of African diasporas, several African nations are investing growing resources in strengthening their ties with expatriate communities (see Kenya's 2013 Diaspora policy). Diasporas may be instrumental in increasing trade between nations as well as promoting cultural ties, tourism and academic exchanges. Social media can help African nations maintain close ties with their global diasporas. Nigerian embassies, for instance, may use Facebook and Twitter to create vibrant social networks in which information on embassy events and Nigerian political issues is shared. Likewise, Kenyan embassies may use social media to provide consular assistance to expats alongside information on investment opportunities in their country of origin. The Ethiopian MFA seems to have most eagerly adopted social media as a tool for diaspora diplomacy. When assessing the online activity of Ethiopian embassies to major expat hubs (i.e., Israel, U.S., UK, Lebanon, Saudi Arabia, and Canada), I found high levels of activity on both Twitter and Facebook. In the U.S., the Ethiopian embassy has more than 30,000 followers on Facebook, while the embassy to the UK boasts more than 10,000 followers on Facebook and 7,000 on Twitter. The same cannot be said of Nigerian, Kenyan or Somali embassies, who seem to be mostly inactive online, thus failing to realize the potential of social networking sites as a tool for diaspora diplomacy. Social media may also help African nations in leveraging their position in the global diplomatic arena. For instance, African MFAs that are highly active on Twitter may attract a significant number of their peers. By doing so, African countries can more easily disseminate information to the diplomatic milieu and voice their stance on issues shaping the global agenda. Similarly, African embassies to multilateral organizations may become important hubs of information online, thus enabling them to influence decisions in such forums. The ability of smaller nations to leverage their position through online activity may be imagined as a form of social media mobility. Recent evaluations have shown that African MFAs have been able to use SNS to elicit such mobility. 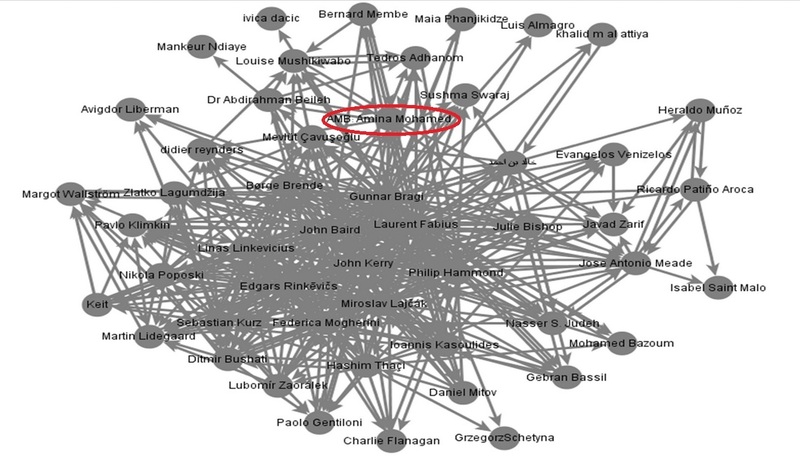 For instance, when analyzing the social network of foreign ministers on Twitter, seen in the image below, I found that Kenya's foreign minister (Ambassador Amina Mohamed) serves as an important hub of information, as she connects ministers that do not follow one another directly. Thus, Ambassador Mohamed is now an information junction in this network, attracting attention from her peers around the globe. When examining the Twitter network of embassies to the UN in New York, I found that Rwanda's embassy was the third most popular embassy in the entire network. Rwanda may thus be in a position to impact the UN's agenda and priorities. Similarly, Uganda's embassy to the UN is the tenth most followed embassy, attracting more online peers than embassies from G20 countries such as Brazil, India, Japan and Turkey. Finally, digital diplomacy may enable African nations to manage their global image, increase their media visibility, attract FDI (Foreign Direct Investments) and amass soft power resources. Through social media, the stereotypical view of African nations as third-world nuclei of corruption may be negated. Such was the case with Kenya's online campaign, launched during President Barack Obama's visit to the country in July of 2015. The high media profile of Obama's visit, which was part of the Global Entrepreneurial Summit, generated a growing interest in Kenya. Kenya strategically employed its social media accounts in order to meet such interest and brand itself as a rising economic power and land of financial opportunity. This included the use of the Obama hashtag alongside a designated hashtag, #chooseKenya, and increased Twitter activity on four main channels: the Kenyan MFA, the President's official Twitter channel, the personal channel of President Kenyatta, and that of the Kenyan Foreign Minister. Combined, these channels carried the new image of Kenya to a global audience of some two million people. Digital diplomacy holds the potential to increase the effectiveness of African diplomacy in diverse areas. The analysis shared in this post demonstrates that African nations have indeed begun to incorporate social media into the practice of diplomacy. However, more research is necessary in order to ascertain if African MFAs have realized the benefits, and overcome the challenges, associated with migrating online. African digital diplomacy should therefore be considered among the research agenda for communication, international relations, and diplomacy scholars. In an attempt to promote this agenda, Prof. Corneliu Bjola and I will host a seminar on African digital diplomacy at the University of Oxford this coming year.